It’s morning rush hour at the border between Spain and Gibraltar and virtually all the traffic is flowing from the downtrodden Spanish city of La Línea de la Concepción into the wealthy British territory. After a quick check of their identity papers, hundreds of people walk briskly across the only runway at Gibraltar’s airport to their jobs in the tiny British enclave perched on a rocky outcrop on Spain’s southern tip. Gibraltar has close to full employment and it has long been a lifeline for people who live in the adjacent area of Spain known as ‘El Campo de Gibraltar‘, which has one of the European Union’s highest jobless rates. But when Brexit comes, it could mean tighter controls at what would be a new border between Britain and the European Union which could jeopardise the easy flow of people that has benefited both Gibraltar and ‘El Campo’. 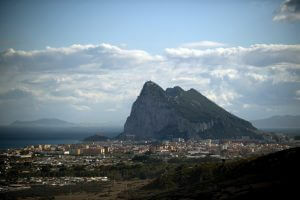 Gibraltar Rock seen from La Linea de la Concepcion, near the southern Spanish city of Cadiz. Gibraltar has close to full employment and it has long been a lifeline for people who live in the adjacent area of Spain known as “El Campo de Gibraltar”, which has one of the EU’s highest jobless rates. ‘I worry they will demand some sort of work visa. No one knows what will happen,’ said Miguel Pereira, 53, who has commuted to a job at a tobacco warehouse in Gibraltar from the adjoining city of La Linea for over three decades. An electrician by training, the married father of two said he would try to find work in the same field in La Linea if working in Gibraltar becomes unviable. But this would be a challenge. The city has a jobless rate of just over 31%. It has been dubbed the ‘drug capital of Spain’ because of the gangs that operate there, employing jobless youths to bring loads of hashish in from nearby Morocco on high-speed boats. Pereira is one of roughly 14,000 so-called ‘frontier workers’ who make the crossing daily from Spain to work, mainly in shops, hotels and the territory’s dynamic financial services and online gaming sectors. While the majority are Spanish, this labour force takes in 59 other nationalities, including some 2,500 Britons who are attracted by the lower cost of housing in Spain. These so-called ‘frontier workers’ account for at least half of the workforce of Gibraltar, which is just half the size of London’s smallest borough of Kensington and Chelsea and is home to around 32,000 people. ‘It’s literally impossible to come up with additional staff to cover all the jobs in Gibraltar that would be affected if frontier workers wouldn’t be able to come,’ said Christopher Wall, the director of Alimentana, a food wholesaler in Gibraltar. The company employs 18 people, half of them ‘frontier workers’. ‘In our sector in particular, right across the retail and wholesale sector, it would be almost impossible to function in the short term,’ Wall added. Some firms are mulling allowing people to work from home, or provide more flexible hours, in case of problems getting across the border, said Julian Byrne, the chairman of the Gibraltar Federation of Small Businesses, which represents around 300 local firms. ‘Some businesses can do it, some can’t, it depends what industry you are in,’ he said at the modern offices of the web design business he runs. Madrid and London have reached a preliminary deal over Gibraltar but final approval will depend on negotiations in Brussels which are currently stalled. While Spain’s current socialist government has vowed to protect the rights of cross-border workers, previous Spanish administrations have on occasion closed the border to exert pressure on Gibraltar, which has been under British control since 1713 but Madrid has long wanted it back. The fallout from Brexit has already started to be felt by shops and businesses in La Linea that rely on clients from Gibraltar. They complain of a drop in sales due to the drop in the value of the pound since Britain voted to leave the EU in 2016. The weaker pound has also hit the wallets of ‘frontier workers’, who now earn less once their pay is converted to euros. Eladio Perez Diaz, 59, who runs an auto body shop in La Linea, said his three step-daughters have all recently quit their service sector jobs in Gibraltar and plan to move to London because they have seen their salaries drop to around 900 euros from roughly 1,400 euros. He said he would ‘almost certainly’ have to close his body shop and move abroad as well if Brexit leads to delays in crossing the frontier since about two-thirds of his business comes from customers from Gibraltar. ‘There are no jobs in La Linea, there is nothing,’ he said as he stood at the entrance to the body shop located on the ground floor of an apartment block with chipped paint on the walls.